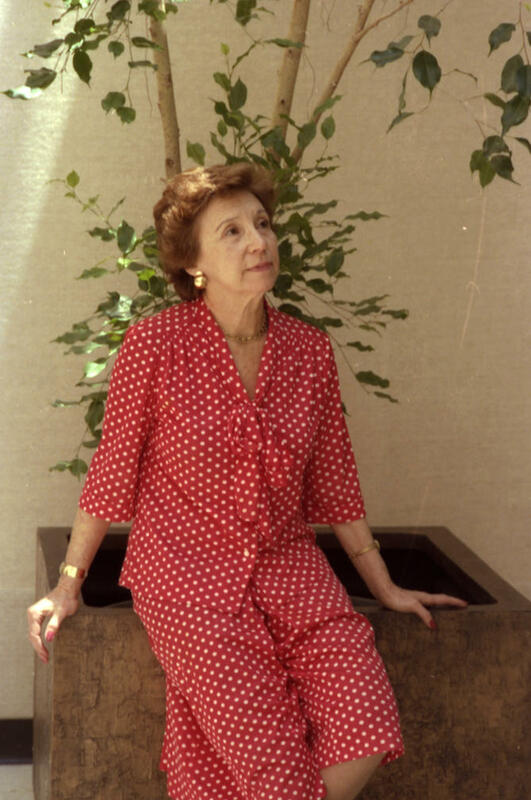 Thalia Mara, a celebrated ballet teacher, dancer, and author of several textbooks on ballet, founded and directed the USA International Ballet Competition in Jackson. In 1994 the City of Jackson changed the name of the Jackson Municipal Auditorium to Thalia Mara Hall in recognition of her profound influence on the city’s cultural community. Born on 28 June 1911 to Russian émigrés in Chicago, Mara began studying ballet as a young child and by age fourteen was a company member of the Chicago Opera Ballet and Ravina Park Opera Ballet. At sixteen, she was a soloist in Paris with the Ballet Suedois de Carina Ari, performing throughout Europe and South America. She returned to the United States several years later and appeared as a soloist with several prominent ballet companies. She soon developed a passion for teaching ballet to others, and in 1962 Mara and her husband, fellow dancer Arthur Mahoney, founded the National Academy of Ballet and Theater Arts. Mara felt that contemporary ballet had declined into “sharp, cold movement,” and she insisted on a return to “lyricism, romanticism, classicism, and musicality [in which] the expressiveness of the individual must be encouraged.” Mara instructed and encouraged many young ballerinas who went on to become principals and soloists with renowned ballet companies. The school closed a decade later because of increasing educational costs, but Mara continued to contribute to ballet instruction by writing respected textbooks for young dancers and teachers. In the mid-1970s, the Jackson Ballet Guild invited Mara to create a professional ballet troupe in the Mississippi capital. She believed strongly that the future of American ballet lay in in broadening the focus from major cities and building organizations in smaller areas. After six years with the guild, she resigned to develop the USA International Ballet Competition in Jackson. The first competition, organized by Mara and Robert Joffrey, artistic director of Joffrey Ballet, was held in 1979 and brought the world’s best young dancers to Jackson. The two-week competition took place again in 1982 and has subsequently been held every four years. It remains one of the most important ballet competitions in America. Mara also contributed to Jackson’s artistic community through the nonprofit Thalia Mara Arts International Foundation, which sponsors teacher training scholarships, a piano competition, and various dance performances. She died in Jackson on 8 October 2003.